here’s a quick upload of a short show by one of my favorite drummers. it’s demuxed audio from an ancient recording from french tv. the audio specs are, in my view, a bit dubious, but the sound is quite good (as is the lineup). so who knows? 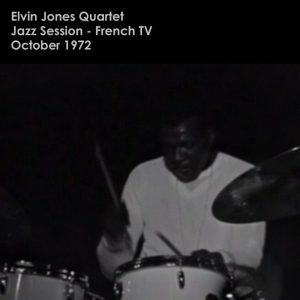 speaking of lineup, the announcer at the beginning refers to “three young musicians” supporting jones… steve grossman was 22, dave liebman was 27 and gene perla was 33. a posting at houseofdrumming.com says that this was “the live at the lighthouse group”. jazz jamboree ’72). dave liebman left elvin quartet to join miles davis band in january 1973.